Every few weeks at the moment The Cruise Examiner is bringing you a special report on niche areas of the cruise market. Last month it was on cargo ship travel and with today’s arrival in Lisbon of the 27,444-ton cruise ferry Nova Star, en route from Singapore to Canada, it is on the subject of cruise ferries. One of the first cruise ferries, Kloster’s 8,666-ton Sunward, resulted in the formation of two cruise lines, first Norwegian Caribbean Lines, now Norwegian Cruise Line, and later Carnival Cruise Lines, the acorn from which grew the largest cruise line group in the world. Today, we look on the other side of the fence at what the world of cruise ferries has to offer. This series will also include reports on river cruises, small ships and expedition voyages, all markets that are growing in step with the main cruise market. Most of us are aware of a ship called the Sunward that started the modern cruise business out of Miami. Some of us even know that she was built on 1966 for a completely different service – an overnight cruise ferry service between Southampton, Vigo, Lisbon and Gibraltar under the name Klosters Sunward Ferries. But when that service stopped because of the closure of the border between Gibraltar and Spain, the Sunward went to Miami for a new entity called Norwegian Caribbean Lines, owned by the Klosters and managed by one Ted Arison. She sailed on her maiden voyage on December 16, 1966, and the rest, as they say, is history. Since the Sunward, there have been many more cruise ferry services on routes around the world, of which the original were in the Baltic and the North Sea. But the news that triggers this piece is the arrival this morning in Lisbon of a vessel called the Nova Star. The 27,444-ton Nova Star is a newbuilding from ST Marine in Singapore and is en route to her new homeport of Yarmouth, Nova Scotia, where she is due on April 14. There, she will revive the Gulf of Maine ferry service to Portland, Maine, which has seen no overnight service for a decade. The Nova Star’s capacity is substantially more than that of the last Yarmouth-to-Portland night ferry, the 12,087-ton Scotia Prince, a former Stena Line vessel that left the service in 2004. The Nova Star was launched as the Norman Leader in 2011, for LD Lines, but the contract was cancelled. She can carry 1,215 passengers and will be operated by a joint venture between ST Marine and Quest Navigation Inc of Maine. The joint venture, incorporated in Maine as STM Quest Inc, will operate under the name Nova Star Cruises. Nova Star will charter the ship from ST Marine under a seven-year contract, with Nova Scotia contributing $10.5 million for start-up costs and $1.5 million per year for marketing assistance, or $21 million over the period. The vessel will be showcased in Boston on May 12 and Portsmouth, New Hampshire, on May 14 before commencing service from Portland on May 15. She will leave Portland at 8 pm daily for a 7 am arrival in Yarmouth (10 hours), and depart Yarmouth at 9 am daily to arrive in Portland at 5 pm (9 hours), all local time. Overnight round-trip cruises will be sold from both sides and this year’s service is due to run until October 31. What follows is a representative list of major operators of cruise ferries on routes worldwide and is not meant to be exhaustive. The principal is the same in nearly all cases. Ships engaged in overnight services are used to offer mini-cruises by taking bookings for a return stay aboard voyage with a visit at the other end of the route on the day between the night crossings. More recent cruise ferries have been fitted out with extensive dining and entertainment facilities, some with outdoor swimming pools, some with twin-screen cinemas, and some with discos. With cruise ferries offering many of the same facilities as cruise ships, it is to be noted that Carnival Cruise Lines’ starboard-side only promenades were adopted from Viking Line cruise ferries, starting with the 46,051-ton Holiday of 1985 (the 35,674-ton Tropicale of 1982 still had the twin promenades adopted from the original Mardi Gras). Color Line, the 1990 merger between Jahre Line and Norway Line, operates a number of routes in the Kattegat and Skagerrak. The 75,027-ton Color Fantasy and near sister, the 75,100-ton Color Magic, the largest cruise ferry in the world, run on the line’s main route between Oslo and Kiel. The line also operates the 33,500-ton Superspeed 1 between Kristiansand and Hirtshals, Denmark, and sister ship Superspeed 2 between Larvik and Hirtshals, as well as the 19,763-ton Color Viking between Sandefjord and Strömstad, Sweden. The Finnish operator Silja Line is the source of the central promenade that Royal Caribbean International adopted for ten of its largest ships. Built for Silja Line’s main route between Helsinki and Stockholm, the 58,376-ton Silja Serenade (199) and 58,377-ton Silja Symphony (1991) were the first two ships to this carry feature. 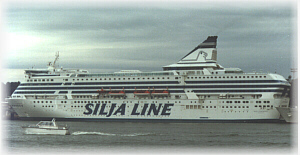 Between 1993 and 2013 the 59,914-ton Silja Europa also ran for Silja Line but has now moved over to parent company Tallink, which bought Silja in 2006. In return two Tallink ships, the 48,915-ton Galaxy and 48,300-ton Baltic Princess, now run on Silja Line’s other main route between Turku and Stockholm. 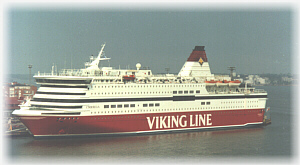 The Mariehamn-based Viking Line runs a number of routes in the Baltic. Its biggest ship, the 57,000-ton Viking Grace, runs together with the 34,384-ton Amorella between Turku and Stockholm via Mariehamn. Being equipped for dual fuel, the Viking Grace has become the world’s first liquid natural gas-powered passenger ship. The line’s other main route, between Helsinki and Stockholm is served by the 35,492-ton Gabriella and 37,799-ton Mariella, while the 46,398-ton Viking Cinderella runs one-day cruises from Stockholm to Mariehamn, and in summertime from Stockholm to Riga and Stockholm to Tallinn. The 35,918-ton Viking XPRS meanwhile runs between Stockholm and Tallinn. A third Finnish company, Finnlines, is now part of the Grimaldi Lines group of Naples, operating several overnight services in the Baltic. Its main long-haul routes run from Helsinki to Travemunde and Helsinki to Rostock, as well as from Lübeck to St Petersburg. Operating eleven roll on-roll off passenger ships, most accommodating between 400 and 500 passengers, but some as few as 120, they are unique in the Baltic as they carry large amounts of cargo. The most recent, the four Ancona-built “Finnstar” class ships, carry 554 passengers and almost 10,000 tons of cargo. Finally, the Russian-owned St Peter Line offers two Baltic services, with the 37,583-ton Princess Anastasia running between St Petersburg, Helsinki, Stockholm and Tallinn, and the 34,093-ton Princess Maria between St Petersburg and Helsinki. Mini-cruises can be bought from any of the St Peter Line ports of call. DFDS Seaways operates nightly service on the Newcastle-Amsterdam route (15 1/2 hours) and two or three times a week on the Harwich-Esbjerg route to Denmark (17 1/2 hours). Two-night minicruise fares are offered at 40% below the return fare for these sailings. The 31,788-ton King Seaways and 31,356-ton Princess Seaways take up the Holland route while the 22,382-ton Sirena Seaways runs to Denmark. 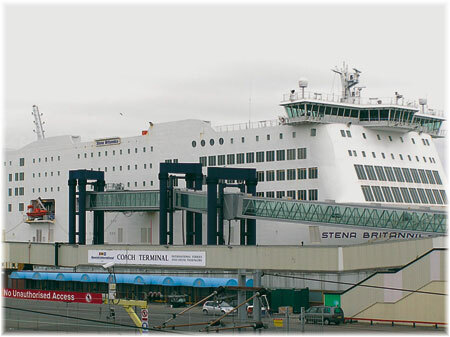 Of its prime cruise ferry services, Stena Line operates daily on the Harwich-Hook of Holland route (6 1/2 hours), with the 63,039-ton Stena Britannica and Stena Hollandica, built in the last two years. Stena Line’s other well-known nightboat service, that between Kiel and Gothenburg, is now operated by the pair of ships that used to operate on the Harwich-Hook route. Mini-cruise tickets come with rail tickets from London, Rotterdam or Amsterdam. P&O Ferries operates nightly service on the Hull-Rotterdam line (10 hours) and Hull-Zeebrugge (12 1/2 hours). The 59,925-ton Pride of Hull and Pride of Rotterdam were built in 2001, while the 31,598-ton Pride of Bruges and 31,785–ton Pride of York serve the Hull-Zeebrugge night service. P&O operates a large number of day and cargo ferry services, as well as routes on the Irish Sea, with a total ferry fleet of twenty ships. 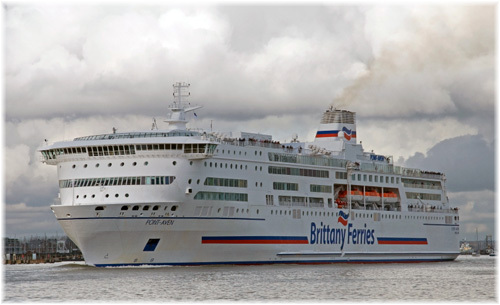 Brittany Ferries operates twice-weekly service on the Portsmouth-Santander and Plymouth-Santander routes (each 24 hours) and weekly between Portsmouth and Bilbao (20 hours). The 40,859-ton Pont-Aven and 32,728-ton Cap Finistère, used on the Santander routes, are both classed as cruise ferries and the Pont-Aven is one of the best. LD Lines operates two new weekly services on the Poole-Santander (26 hours) and Poole-Gijon (25 hours) routes with the 27,414-ton Norman Asturius. LD Lines has also opened a weekly ferry route from Ireland to France and Spain with the 26,904-ton Scintu. She crosses from Rosslare to St Nazaire (22 hours) and continues on to Gijón. Ferries depart Rosslare on Fridays at 9 pm, arriving St Nazaire at 17 pm the next day. The total elapsed time from Rosslare to Gijon is 39 hours. In similar waters, Irish Ferries’ 26,375-ton Epsilon has begun weekly service between Dublin and Cherbourg, a voyage of 19 hours. The ferry sails overnight, departing Dublin on Saturday at 3:30 pm, and arriving in Cherbourg on Sunday at 11:30. The return journey leaves Cherbourg Sunday at 5 pm, arriving in Dublin on Monday. DFDS Seaways has recently taken over LD Lines’ shorter English Channel routes, in order to allow LD Lines to concentrate on the Spanish market. This leaves the former LD Lines Portsmouth-Le Havre nightboat service in the hands of DFDS Seaways, which will soon be adding another overnight service between Marseilles and Tunis. Grandi Navi Veloci, formed by Aldo Grimaldi in 1992, has added some wonderful cruise ferries to the world fleet in recent years. It offers service from Italy to Sardinia, Sicily, Spain, Tunisia and Morocco as well as France. Its fleet now numbers ten cruise ferries, of which the 49,257-ton La Suprema and La Superba are the largest. These have been added to the 39,777-ton Excellent, 39,139-ton Splendid, 35,222-ton Fantastic and 32,777-ton Majestic, plus four other vessels. Its main services include three routes to Palermo, one each from Genoa, Naples and Civitavecchia, as well as three routes from Genoa to Barcelona, Morocco and Tunisia and two from Civitevecchia and from Palermo to Tunis. La Suprema and La Superba’s elegant interiors are by Giuseppe De Jorio, who also designs the interiors of MSC’s cruise ships. These are two of the most stylish cruise ferries in the world, featuring a wide variety of restaurants, lounges, bars and other facilities, plus an outdoor pool to allow passengers to enjoy the Mediterranean sun. Another arm of the Grimaldi family, based in Naples rather than Genoa, runs Grimaldi Lines, which offers cruise ferry routes from Genoa to Catania and Malta, Leghorn to Barcelona, and a number of other routes serving Sardinia, Sicily and Tunisia. The flagships of the Grimaldi Lines fleet are the 54,310-ton Cruise Roma and Cruise Barcelona, both of which have an exciting array of restaurants along with swimming pool and disco for the nightlife. These ships are supplemented by the 25,995-ton Catania and 25,984-ton Sorrento, and the 29,289-ton ropax Euroferry Brindisi, which has been transferred in from Finnlines, where had served until last year as the Finnarrow. One former cruise ferry, Thomson Cruises’ 40,171-ton Island Escape, was built for a new cruise ferry operation between New York and Nassau in 1982. At first named Scandinavia, she later traded on the DFDS service between Copenhagen and Oslo. Between 1985 and 1990 she operated for Sundance Cruises and Admiral Cruises, and in 1990 became Royal Caribbean International’s Viking Serenade, when her car deck was replaced with passenger accommodations. She has traded as island Escape since 2002. 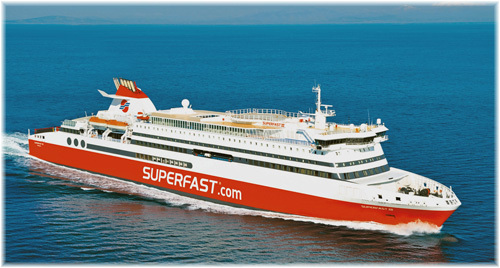 Superfast Ferries operates the 30,902-ton Superfast XI and Superfast XII between Ancona in Italy and Patras, Greece via Igoumenitsa. Established by Pericles Panagopoulos, who also founded Royal Cruise Line, Superfast revolutionised the Greek ferry industry and its first ten vessels have found homes around the world now. The voyage from Ancona to Igoumenitsa is 15 hours and it is an additional six hours to Patras. Blue Star Ferries, now an affiliate of Superfast Ferries, operates another modern fleet of Greek ferries, on a large number of domestic routes from Piraeus to Crete and the Greek Islands. Its fleet numbers nine vessels, of which the newest are the Daewoo-built 18,498-ton Blue Star Delos and Blue Star Patmos, completed in South Korea in 2011 and 2012. Meanwhile, Grimaldi Lines’ Greek affiliate Minoan Lines operates the 29,968-ton Ikarus Palace and 31,739-ton Zeus Palace. Routes include Venice to Patras via Corfu, Ancona to Patras via Igoumenitsa and Piraeus to Heraklion in Crete. The Alaska Marine Highway has been offering overnight ferry service on its main line between Bellingham, Washington, and Skagway, Alaska, since 1989. This is the line’s connection to the mainland USA, with sailings being offered from Bellingham every Friday year round and arriving at Skagway on Monday. This 3-night passage in the 13,009-ton Columbia is probably the longest cruise ferry route. The route is also offered, but less frequently, by the newer 12,635-ton Kennicott, which also performs a monthly voyage from Juneau to Kodiak. A more frequent connection to the North American highway network is offered from Prince Rupert BC by the 9,214-ton Matanuska and the 7,301-ton Taku, where the All ships call at Ketchikan, Wrangell, Petersburg and Juneau on their northbound voyages, with some ships proceeding beyond to Haines and/or Skagway. The Columbus is presently at the Todd Pacific shipyard in Portland undergoing a winter overhaul/ before commencing her 2014 season to Alaska. 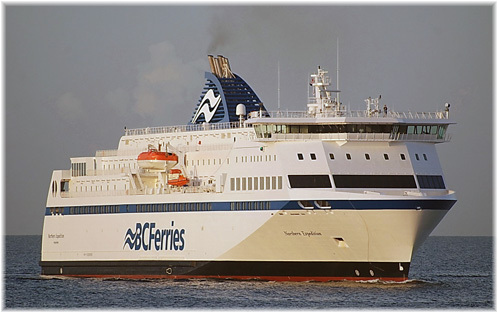 One of the world’s largest ferry operators, BC Ferries in Canada, operates an important long-distance route, connecting Port Hardy at the northern end of Vancouver Island with Prince Rupert. Built at Flensburg in 2009, the 17,729-ton Northern Expedition offers overnight service most of the year, leaving Port Hardy twice weekly in the afternoon or evening, calling en route at Bella Bella, and arriving at Prince Rupert the following afternoon. From Prince Rupert, connections can be made to Alaska. This vessel is backed up by the 2004-built 9,844-ton Northern Adventure, which was acquired from Greek owners in 2007. In the summertime, BC Ferries’ inside Passage route is operated as a day service, but as the same ship often serves the Queen Charlotte Islands from Prince Rupert these sailings are now packaged with hotel accommodation into 4-to-8-day holidays by subsidiary BC Ferries Vacations. 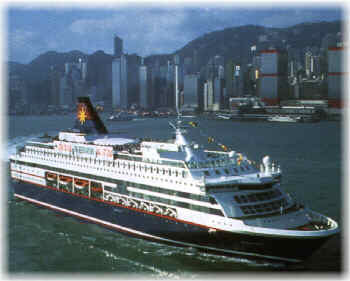 The earliest cruise ferry operations in Asia were those of Star Cruises, which started with two cruise ferries acquired from the bankrupt Rederi AB Slite in 1993. 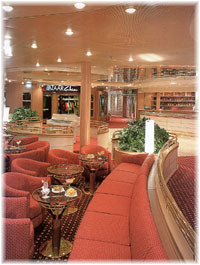 In 1998, Star Cruises took delivery of its first newbuildings and soon went on to acquire Norwegian Cruise Line. 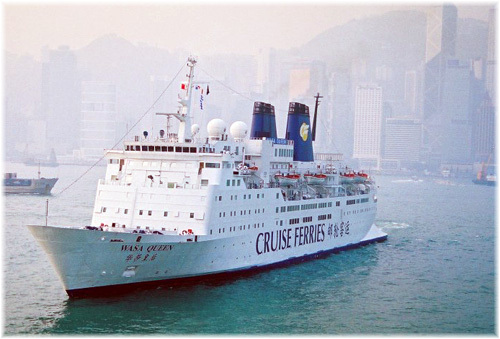 In 2001, it founded a new company, Cruise Ferries, which began operating the 16,546-ton Wasa Queen on short cruises from Hong Kong to Xiamen and overnight gambling cruises from Hong Kong and from Port Kelang, but it sold off its only ship in 2007. Of the present fleet, the Star Pisces is one of the two original cruise ferries while the other now operates for DFDS as the Pearl Seaways. The recent acquisition of the Costa Voyager by the Bohai Ferry Company has brought attention to the fleet of ferries they operated across Bohai Bay in China. The company currently operates passenger ro-ro services between Yantai, a city of 6.5 million, and Dalian and is the largest such operator in China. When Bohai Ferry went public in 2012 it also set an objective of entering the international cruise business. Bohai Ferry’s latest series of four 35,000-ton ships offer mini-cruises from Yantai with a short stop in Dalian for cruise passengers. Accommodation is very modern and clean, but spartan compared to European ships, with communal sleeping and toilet facilities as well as private cabins. These new ships were all built in China. There are excellent guides that cover these ships and we would recommend Shippax of Sweden, an annual publication, and Cruise & Ferry International. Several reliable ferry booking sites are also available on line. Further an updated list of cruise – ferry operators is published at www.cybercruises.com/cruiselines.htm.